Recently I posted an article about liquid polymer clay where I introduce you to this material. In that tutorial, I explained what is liquid clay, how to apply it, store it, for what you can use it, and how to bake it in the oven. Now I want to show you how to cure it with the heat gun. Also, I will share some of the mistakes I made when I started using the heat gun, what I learned from them and what you need to do to avoid those mistakes. 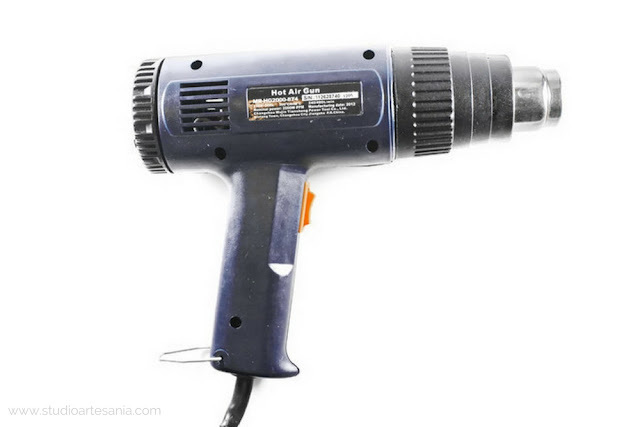 A heat gun (often called hot air gun or hot air station) is a device used to emit a stream of hot air. Do not confuse the heat gun with the hair dryer, although they look very similar. 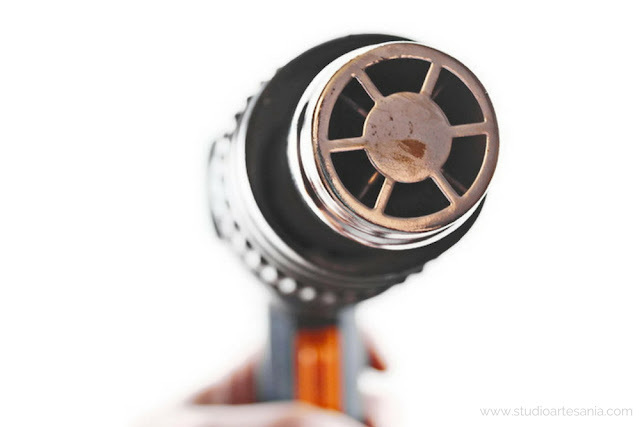 Heat guns are made up of a source of heat, for example, an electrically heated element or a gas flame and have an electric fan that has the ability to move the hot air. It may also come with a nozzle that allows the user to direct the hot air towards a particular object. 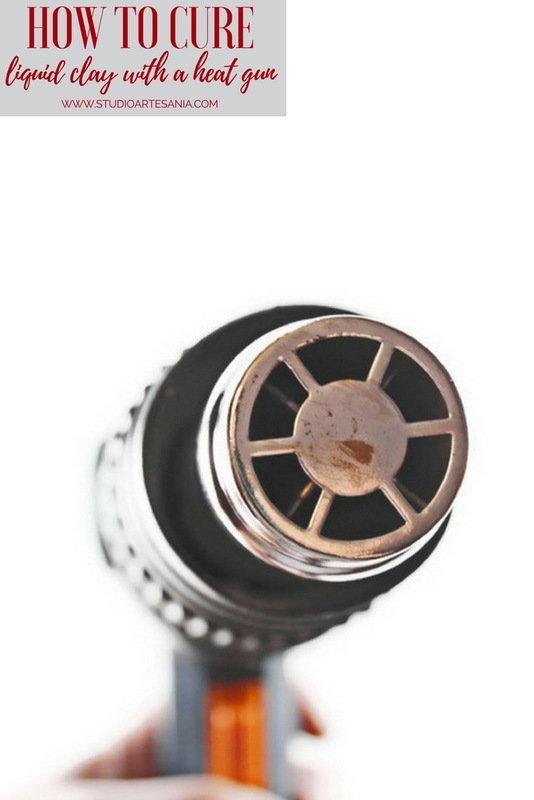 The nozzle comes in various different shapes, depending on the requirement of the user. There is a trigger on the handle, which when pressed turns the machine on. It may also come with an external stand if the user does not want to hold it for long periods of time. Depending on the usage, the type of heat guns differs in terms of heat temperature and how the airflow is directed. On the market, there are two different types of heat guns that can be used for polymer clay. 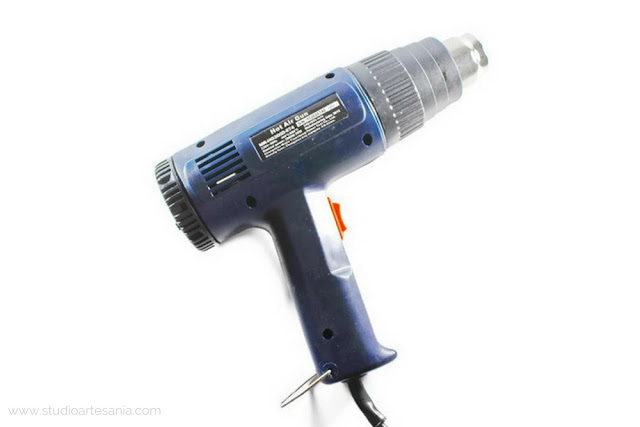 There is heat gun for the hobbyist which is mainly intended for scrapbooking, embossing and such things, and the professional/industrial heat gun that craftsmen use for stripping paint and varnish, loosening rusted nuts and bolts or thaw frozen pipes. The main difference between those two heat guns is at a temperature and airflow they can develop. Also, they slightly differ in the design. The embossing heat guns are looking more like a stick, and they have a built-in stand, until industrial are bulkier and they usually have the form of an elongated body pointing at what is to be heated, with a handle fixed to it at right angles and a trigger, in the same general layout as a handgun. Embossing heat gun (often called mini heat gun) has lower temperatures range (approximately from 100 to 300 ° C/212 to 572 ° F, depending on manufacturer) until the professional one has higher temperature range (approximately from 300 to 800 ° C/527 to 1472 ° F, depending on manufacturer). Those temperatures from the heat guns far excide what you need to cure polymer clay. To remind you, the ideal temperature for Fimo is 110 ° C (220 ° F), for Sculpey 130 ° C (266 ° F), and for Kato 150 ° C (302 ° F). So if you use embossing heat gun set it at 200 ° C (392 ° F). I use an industrial heat gun that I got from my dad, and its temperature range is from 350 to 600 ° C (662 to 1112 ° F). I always cure the liquid clay on lowest temperature, which is 350 ° C (662 ° F). It's hard for me to recommend which one of those two heat guns you should get. I love my industrial heat gun, and it will work great for you as well if you will use it only for polymer clay. But, if you want to use it for other artistic things, such as embossing, then get a hobbyist one. You know better what your artistic/crafters needs are, so get the heat gun according to them. The industrial heat gun you can find in every hardware store and embossing heat gun is available in craft stores. If you have the opportunity to check the heat gun you want to buy, make sure that it does not blow all around. The jet of hot air must be pointed (preferably with a nozzle) and blow needs to have the less forced flow. This question I've heard very often at my workshops and the answer is - NO, you can not. Although not called such, a hair dryer is basically a form of a low-temperature heat gun. However, hair dryer and a heat gun are not the same and are also used in different contexts. 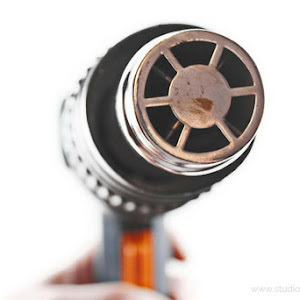 Hair dryers are well for drying hair mostly and can also be used sometimes in case of a heat gun, for example, to dry thicker layer of acrylic paint on canvas. A heat gun emits much higher temperatures compared to hair dryers and is used for commercial purposes. It should never be used on the hair as it can result in singeing the hair. These are two completely different devices and should not be used interchangeably. 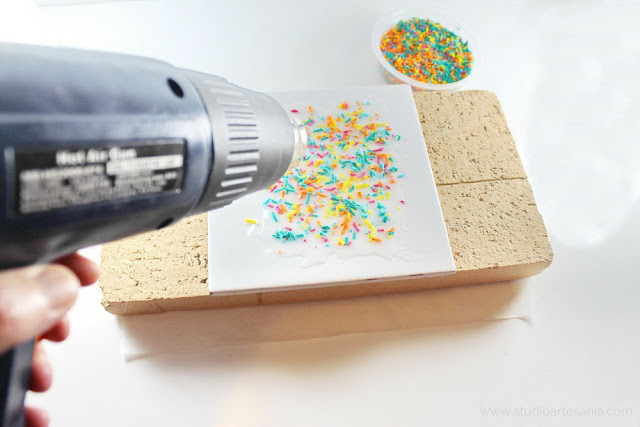 When I got my heat gun I did not have a clue how to work with it, and how to use it for polymer clay. At that time there was no tutorial to explain how to cure the polymer clay with it, and the only one I found, I know that now, was incomplete and inaccurate. So, I made three big mistakes and learned a lot from them. I did not think and at the beginning, I used the glass as the baking surface. Thick glass, but glass! Eventually, that glass has burst from heat. I do not know what was more annoying - a destroyed piece of jewelry I worked on or the fact that I've been collecting pieces of broken glass scattered all over my apartment for the days. Luckily I wasn't hurt, but when that glass broke everything could go wrong. I could get cut, the piece of glass could end up in my eye... Even now I'm scared to think what can happen because I did not use my brain. That was my mistake number one from which I learned to never ever use glass for curing the liquid polymer clay with a heat gun. Then I started to use ceramic tile as a baking surface. It worked as a charm until one day I noticed traces of ignition (not burns per se, but yellowish traces similar to those when you place a hot cup of tea on the table without coaster) on my wooden working desk. It was an old desk, but anyway I did not want those traces on it. I knew that my heat gun is strong and that it could develop a high temperature, but I completely forgot that the ceramic can transfer the heat. I wasn't thinking! Again! Maybe now you think I'm completely crazy because a lot of polymer clay artist (me included) use ceramic tiles as work surfaces, as well as baking the clay in the oven, but the fact that ceramics and porcelain can absorb temperature is the reason why those tiles are used as a floor covering for underfloor heating. 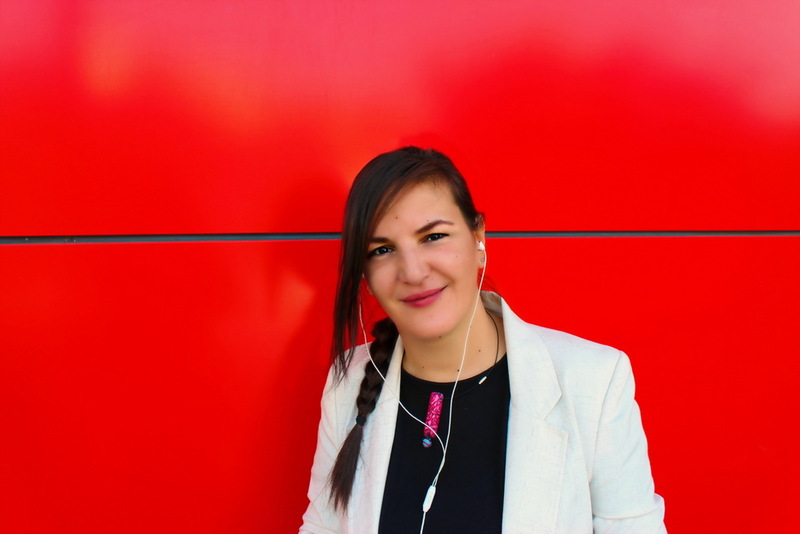 That's why you have to check when you buy a cover for underfloor heating, the thermal conductivity of tiles, which means how well the floor material of your choice transfers heat from the heating system to the surface of the floor. Just remember how many times you burn your fingers on a ceramic or porcelain cup full of warm tea or coffee and you'll know what I'm talking about. Since the ceramic tile can warm up a lot of polymer clay artist (including me) use it during the baking to keep the temperature underneath the clay even. I was in the hurry to finish the large order and I did not let the tile to cool down between pieces I needed to cure with a heat gun, so the tile has warmed up to the point that it began to leave marks on the table. That was my mistake number two from which I learned to always place a ceramic tile on the surface that can't be burnt. And, to let it cool down after every use no matter how much I'm in the hurry. After those two fiascos, I start to use my brain and remembered the firebrick I had from days when I worked with pottery. Ever since I use it when I cure liquid polymer clay with a heat gun. The firebrick can stand high temperature (depending on the type it can stand the temperature of 1500 ° C/2732 ° F), and it can't transmit that temperature easily on other surfaces. As we finish the baking with a heat gun that lasts for about a minute or two, the brick does not even get warm, which protects our desks. But, what you will do if you do not have firebrick? Since my parents live in another city, pretty far from where I am, and my firebrick was in their house, until I took that brick I worked on my balcony, the only place in my apartment that has concrete surface. That worked very well because concrete can't heat up easily, and it can't get burn with a heat gun. So, the solution is to find the concrete surface in your surrounding and to work there. I know it can be hustle, especially during the cold winter days, but better to be safe than sorry. Learn from my mistakes and always work on the heat-resistant surface. If you want to work with polymer clay seriously and you intend to use liquid polymer clay as a glaze or filling a lot I highly recommend you to, as an addition to ceramic tile, get a firebrick as a working surface. If you cure one to two pieces per day or week you can use ceramic tile, but place it on the concrete floor. If you work with a heat gun on an already baked piece of clay in order to get the glazing and filling more transparent than you can place it directly to the firebrick. There are some techniques that require baking the sheet of liquid clay with the heat gun as an application for the piece that latter will be baked in the oven, so in that case, put the firebrick beneath the ceramic tile. The firebrick you will find in shops for pottery artist or in local shops where you can get parts for the fireplace or pizza stoves. Also, it can be purchased in certain craft stores, as well online. When I got my heat gun I was so excited and I could not wait long to try it. Immediately I grabbed one of the pieces of jewelry glazed with liquid clay and previously baked in the oven, take out my heat gun, point it in the clay and started it up. After few seconds I noticed smoke followed by a terrible smell. I wanted to make the glaze more transparent, but I ended up with a burned piece of jewelry. 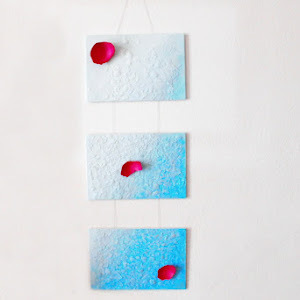 I already told you that at that time I find online only one tutorial for using a heat gun with polymer clay, and in that tutorial was stated that the heat gun must be very close and pointed in the clay. What a disinformation! That was my third mistake! That night I talked with my dad over the phone and I started to complain about heat gun, burnt piece of jewelry and how I do not know what I did wrong since I followed that tutorial exactly from word to word. Among other things, he told me that when he uses a heat gun for stripping paint he do not point it at one place, but move it around the surface, and hold it away of the surface he treats. He advised me to try it that way. Next day I started to experiment. I made few test pieces and tried to figure out how to use that heat gun. So, here is what I learned from my experiments - you must move that heat gun. Move it up and down, left and right, in a circular motion, however, but keep it moving and rotating. If you point the heat at one place, and since the air is hot, you will burn that spot. Therefore, moving the heat gun is very important. Your movements should be even and at medium speed. By moving, you distribute warm air equally to the entire surface and prevent to burn it. The distance between the clay and heat gun is also very important. If you use embossing heat gun you will hold it 8 to 10 cm (3 to 4 inches), and industrial at 12 to 15 cm (5 to 6 inches) away of clay. These measures are just references. When you cure the clay with heat gun for the first time I suggest you take some of the pieces that are not so important to you, or make few test samples, to place the heat gun at highest point (around 20 cm/8 inches) from the clay, and while you moving it in circular motion slowly lower it down until you find the distance that works the best for you, and where your clay will not burn. You may burn some of those test samples, but at least you will know the high you have to hold your heat gun when you work on more important pieces. Experimentation is highly recommended before applying this method to your finished piece. Every heat gun is different and it will take you a little while to master it. You will burn few pieces during practice, but after that, you almost never will burn applied liquid clay. Also, know that the closer you are to the clay the faster you need to move the heat gun. If you notice the smoke move the heat gun away from that section and let it cool down. 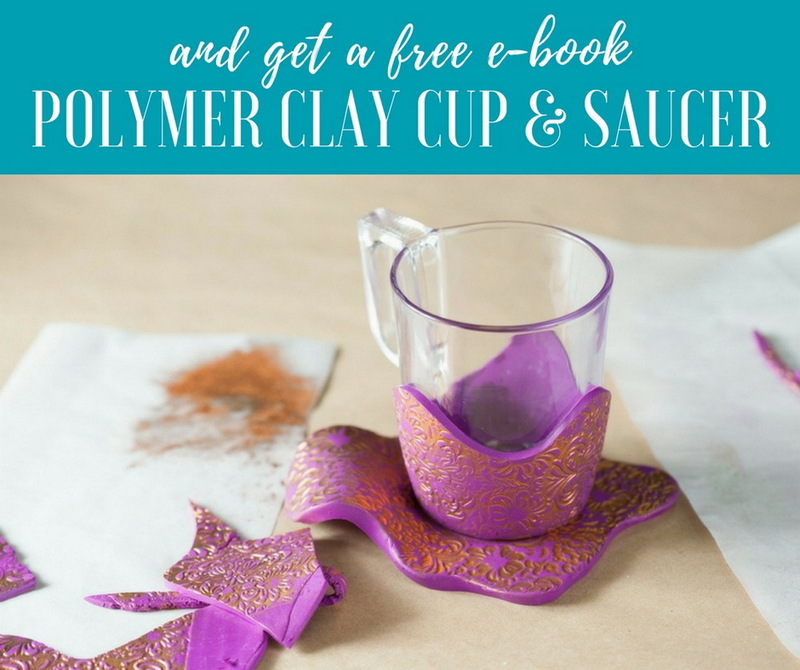 You can use this method not just for liquid clay, but also for regular polymer clay pieces that are not very thick or as an option prior to conventional oven baking to help prevent flattening of edges while on the baking tray. To know that your liquid clay is sufficiently cured look for the changes in the surface of the clay, as well as overall transparency to indicate when the liquid is clear. 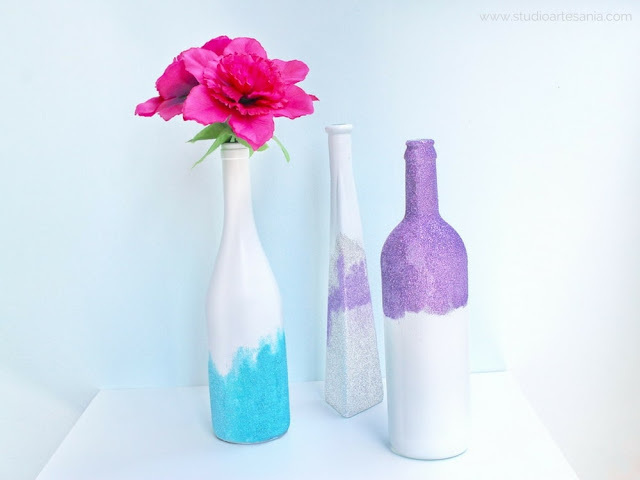 When your clay is clear, and usually it takes about a minute or two depending on the thickness of the coating, that is the point when you have to turn off the heat gun. Then let the clay to cool completely. If you want to speed up the cooling process carefully transfer your piece so you do not get burn to the bowl of cold water. When you use a heat gun you must always be aware of the risk of burning polymer clay, so always work in the well-ventilated area. During the heating avoid putting your hands or anything that can be melted or burned in front of the jet of hot air. After you finish, place the heat gun on the heat-resistant surface. Don't touch the tip of the heat gun or place it close to anything that can melt or burn. The tip will be very hot and it could easily burn you or destroy your belongings.